the load straps. They are then attached to the tensioning pendants by a pelican hook assembly. During an emergency arrestment, the force of the aircraft engaging the barricade breaks the multiple-release straps, releasing the barricade from the tensioning pendants allowing it to fall over the aircraft. The energy of the engagement is then transferred from the barricade through the purchase cable to the arresting engine. BARRICADE STANCHIONS Barricade stanchions house the winches that tension and support the barricades. They further provide the structure on which the barricade is raised or lowered. 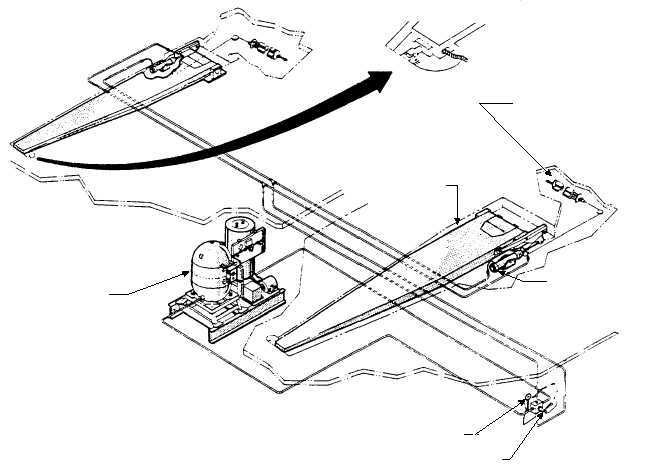 Except for differences of location and position of the actuating apparatusdeckedge, above or below deckport and starboard stanchions are identical. The port stanchions with their actuating apparatus are described in this chapter. Barricade stanchions (fig. 3-39) are welded steel, tray-shaped assemblies that consist essentially of a base on which is hinged the frame. Each barricade frame contains the winches, sheaves, and pendants used to tension the upper barricade webbing load strap. Each barricade stanchion is provided with a slot, at the top of the inboard side, through which passes the upper tensioning pendant. The frame moves as a hinge around the two stanchion shafts, the barrel of the hinge being the base and the knuckles of the hinge being the hubs of the stanchion frame. The two shafts act as the pins of the hinge. The actuating arm is keyed and pinned on the outer shaft and is pinned to a holder on the stanchion. Rubber bumper pads are bolted in the deck recess to cushion the shock of lowering the stanchions. 3-38 STANCHION LATCH ASSEMBLY COUNTERBALANCE SPRING ASSEMBLY CYLINDER ASSEMBLY DECKEDGE CONTROL VALVE PRESSURE GAUGE STANCHION POWER PACKAGE ABEf0339 Figure 3-39.Barricade stanchion installation.